have been involved in the Project since the Vietnam era: others are relative newcomers. But whatever our history with the Project, we were all inspired by the parable of The Hole in the Ground. 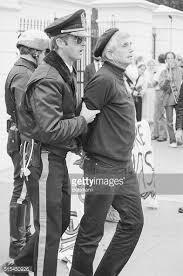 On April 30, 1987, 177 people of all ages were arrested for trespass at the doors of the Honeywell Corporation. More than a thousand of us encircled corporate headquarters early that morning, weaving a line of human resistance around the fortresslike brick building in south Minneapolis, where fences had been erected to bar our entrance. So pay heed now to the sad tale of an arrogant yet foolish people who had everything, who had become bored of being first in everything. The story could not be more compelling, relevant and truly descriptive of the dangerous edge of the precipice we face today, having just reinvigorated the Cold War and nuclear arms race under the ever-mounting specter of climate destruction. Our blessed Hole (like God, it has to be capitalized) turning quickly to nightmare. 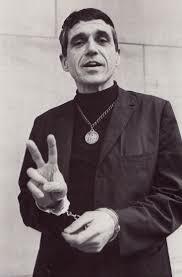 Following the teaching mode of Jesus himself, Daniel Berrigan hoped his telling of this simple story might prove effective in persuading us to give up our awful dream before it’s too late. 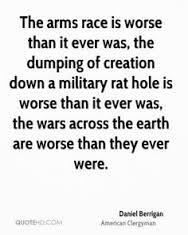 The first edition of The Hole in the Ground was published by the Honeywell Project, an antiwar organization in Minneapolis that regularly protested Honeywell Corporation’s production of weapons of mass destruction. Honeywell Corporation’s headquarters left Minneapolis and rolled much of its stock to Alliant Techsystems Systems. Weekly vigils continued at Alliant Techsystems in Hopkins and then in Edina and then Eden Prairie until they left the area. Both the Honeywell Project and Alliant Action no longer exist, but their dedicated members continue antiwar activities in the Minneapolis/St. Paul area. April 29, 1987, was a special night for many of us involved in the struggle for peace and justice. 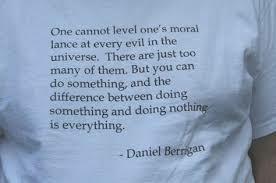 Daniel Berrigan spoke these words at a rally for the Honeywell Project. Some of us have been involved in the Project since the Vietnam era; others are relative newcomers. But whatever our history with the Project, we were all inspired by the parable of The Hole in the Ground. 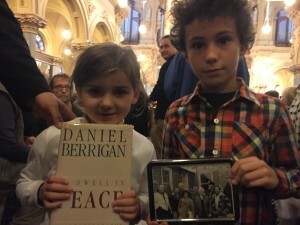 Because the words of Daniel Berrigan at a rally the night before had been so inspiring, and because The Hole in the Ground is such an accurate, vivid description of the drain on human and material resources engendered by the arms race in our own country and the world, I wanted to see the parable preserved in book form for those of us who were there that night and make it available to those who were unable to attend. With the support of Honeywell Project affinity groups PAMM I and PAMM II and a committee consisting of Deborah Bancroft, Carol Masters, Martha Roth, and Sarah Standefer, this book now exists. 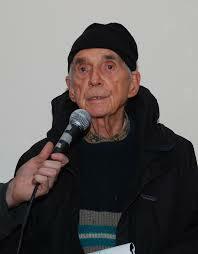 We wish, first and foremost, to thank Daniel Berrigan for giving us permission to print the text of his talk. We also wish to thank artist Karl Bethke for donating the use of his print, as well as making available the print by South African artist Vuminkosi Zulu. And thanks also to Marv Davidov, Richard Seymour, and Abby Jensen of the Honeywell Project; Donna Webb of Full Moon Photography; Smart Set typesetting services; and the many others who have given support and resources in making this book a reality. Dan, this isn’t going to be an introduction in the usual sense. This is a greeting from all of us to you, and I have the privilege of speaking it. If you can hear the song of our souls, it is a love song to you. You have been away from us only in body only in some chemical way—never in spirit—never in any real way, because the ties that bind together and bond those who struggle for peace and yearn for justice are not broken by something so insubstantial as the space between us at times. Four and one half years ago, Dan, you came with Emile deAntonio and Martin Sheen and your great film, In the King of Prussia, and joined us, encouraged us, energized us for a major step in our odyssey to stop Honeywell’s awful weapons business. The arrests began, but there were many among us then who still believed that a decent demand would touch the conscience of Honeywell executives. But now we know, for against the storm of our protests, our pleas, our prayers, Honeywell has gone deeper and deeper into their terrible business. Now you return to a peace community that has been tempered into a resistance community. They say the seed never sees the flower, and the flower of a decent world, a nonviolent world, has certainly not bloomed. But surely you can see the seeds of your seed. It has been well sown. Perhaps we can see in our soul’s eye the buds—perhaps a scent of our hopes fulfilled and our prayers realized. Dan, friend, poet, brother, peacemaker, troublemaker, burst of fragrance, thank you for coming back to us. There was once a people who were bored with winning. They were Number One on every page of the Guinness Book of Records; first in jogging, smoking, money making, lariat spinning, first in per capita number of psychiatrists. You name it, they had it. They were first in war, first in peace, first in being first. There was only one rub to this paradisiacal scene. The people were bored. “So we’ve done it again, big deal,” they complained, switching off the tube. “Same old Olympics, same old world trade, same old gross national product.” They grew cynical, ungrateful to their national icons, the lariat spinners, tycoons, joggers, smokers, psychiatrists. “It’s not that we’re so hot. More like lousy competition.” And so it went. It was dangerous. They were well on the way to another kind of record, first in national boredom. Their president was informed of the situation. He was not exactly a strong and raging fire in such matters; but having time on his hands, he gathered his counselors. Silence settled down. The president had lathered himself into a fine virtuous contention. He leaked acid around the room. “You’re supposed to be advising me, aren’t you, keeping me on the ball? Well, let’s hear it; advise the hell out of me. Fact is, people are bored with our act. Don’t you know,” he fumed, “a bored citizenry is dangerous, a national sitting duck, pickings for the kingdom of evil?” He hit them high, he hit them low, mixing metaphors like mad. No boredom here. He felt better after that. The advisers scattered in depression of spirit. Some shrugged off the scolding, some were perplexed, some were plowed with worry. A few even gave some attention into ways and means of unboring America. This was hardly a frolic. More than a few of the President’s men were themselves bored to desolation; with him, themselves, wheels and deals, wives, cookouts, et al. They fretted away; how the hell do you fishline others out of the sludge when you’re stuck in it yourself, up to your follicles? Then, Eureka! One of them, a genius of sorts, a toilet-seat salesman from Texas, blew back into Washington like a comet, eyes shooting inspiration like a struck oil well. The meeting reassembled. Our genius grabbed himself a seat at the right hand of power. It was clear from the word go that the President’s mood hadn’t improved, for all that R & R at Camp David. Nothing daunted, our Texan commenced. “Mistah President, we’ve got it,” he cried, not forgetting that old rah-rah plural. “Now hear this. How about if we dig the biggest widest deepest hole in the history of the wohld? Jes’ think of it.” He held up his hand, palm out, restraint, give it time, slow down. “Think of it, give it tahm. Millions of bored cit’zenry put to useful laybah, billions of stagnant dollahs rollin’ again.” His arms made gigantic dollar signs in thin air; cigar ashes settled like a benediction on his silk suit. They saw he was ignited, the gleam leapt from eye to eye around the table. It was like ten Wall Streets at high noon. “Splendid!” boomed the President, and “Splendid!” went up and down, back and forth, a sonic boom and its echo. So it was done. In a remote corner of the land, out of sight of TV snoops, moles, KGB creeps, the digging started. The great machines arrived; they clawed and snarled, bucked and crawled, grunted and pushed away, night and day. In no time at all, the hole was so deep the workmen were going up and down on cable elevators. After a shift, they’d surface in stages, pausing in little cells clinging to the sides of the hole to avoid the bends. Deep, deeper, went the Number One Dig. The project had sound, top-secret backing, huge amounts of money were shoveled in. The money came from somewhere, who cared where? If here and there a media snoop stuck a nose in the wrong tent, he got clipped, but fast. Sound, secret as God’s pocket, the hole went deeper. More and more workmen were transported to the site under cover of night, families and all. More and more scientists, sworn to secrecy, were hired to deal with the complex questions which the hole, so to speak, raised; gravity, density, air, weather, and so on. It was strange, when you thought about it. (Very few thought about it.) The hole was top secret, yet everyone in the country, in one way or another, was in on the secret. A vast continental hole network arose and spread. Few knew what they were working at, researching, computing, deploying. Yet millions of people were being sucked in, taking their bread from a vast hole in the ground. It was like a cornucopia in reverse. Out of the void came everything; came cars and TVs and freezers and college for the kids and designer clothes and second homes. What a blessing! It seemed only fitting that God be invoked and rendered thanks. One day a noted TV preacher was invited to the site. He and the President shook hands fervently and were ushered into Helicopter One. It rose straight up, steady as God’s right hand. Then it veered and wheeled, north and south, east and west; like a smart Christian insect, it traced a vast cross over the hole. Just like God, the Hole was thenceforth thought and spoken of with a capital letter. Still and yet, blessing or no, it couldn’t be said things were going well for the citizenry. A vague discontent roiled up in the land. It came from nowhere, it was everywhere. In point of fact, things seemed to get worse in exact proportion as the Hole galloped toward a world record; more money dumped in, less of everything for people. The economy quaked, the dollar sank out of sight. Then, one day, terror struck. The Hole started to take charge. What had been a small mouth on the earth’s vast face, a wrinkle, one declivity among many—suddenly it seemed, overnight, the Hole became a kind of stalking Grand Canyon. More and more earth caved in around it. Huge workers’ camps buckled and slid gently into its maw. Cars went in, streets fell under, hills folded up like tarpaulins or dough. And yet, irony of ironies, the achievement was all but ours. One more scoop, largely ceremonial! A hand hovered above the phone; the code message VOID IS US would flash over the hot line to the White House. That Hole! It surpassed the Great Siberian open pit, the Mesabi Iron Range. It was deeper than the central valley of Switzerland measured from atop Matterhorn, wider than the African plains from Nairobi to the sea. The message flashed. The White House knew; the people did not. Order from the top; no flags, no headlines, no TV trumpeting, no ticker-tape parades. The President was unavailable. He was on his way somewhere else, he was in conference, he had laryngitis, he would issue a statement tomorrow or the next day. The White House was locked up tighter than a summer camp in January. We swung gently in the wind. We had our world record—and everything was unraveling. The Hole was no longer a simple gap in solid earth. It had risen on its own legs, declared open season on humans. The rumor went like a thunder, like Armageddon. Planet earth was in danger of turning inside out, a black hole in space! Finally, the President came to. Haggard and sleepless, the famous artless grin gone with the wind, he called a midnight security meeting. The news he clutched in his hand was terrifying, the boyish voice broke and shrilled in the telling. The Hole was becoming bigger than anything, bigger than the world. The U. S. of A. could shortly be swallowed whole. It was no time for buckling under. It was a time for Founding Fathers, for Freedom Fighters. The generals and PR types and salesmen around the oval table stiffened their spines. All spit and polish, gruff, sleepless, humming with the power of positive thinking. And the generals and PR types and salesmen looked statesmenlike and steady, into the middle distance. The hot line-rang. The Chief of Staff leaned over to grab it. His face was like a Founding Father’s, chiseled into the side of a mountain. Seasoned old pro, Number One in charge of Number One. He listened. His eyes went blank. His face fell in like dough in a cold draft. The phone dropped, it spun there on its wire, swinging gently. You heard a semi-articulate scream, as though a doll were being throttled. Chicago was sliding into the Hole. Omaha was gone. So was the crew of one hundred thousand cement pourers, so were all ‘dozers, mixers, trucks, caterpillars, backup crews. So was Salt Lake City. And just as the phone went dead, so went Minneapolis-St. Paul. That was how it went. The rest you know; the day we won, we lost. We have larger evidence from churches and synagogues, offering like testimony. 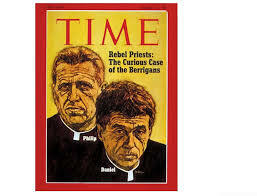 I am haunted by the statement of the Second Vatican Council: “The possession of such weaponry is a crime against humanity.” The crime, the Council went on to say, consists not only in the explosion of such arms, but in the very possession; the sin being larceny of time, money, resources, all of which belong to the people. Into the hole everything is sliding and falling. Not only our world, our environment, but the world’s children. Bread for the world or arms for the world? Honeywell makes one choice, we try for another. Daily, Honeywell echoes, like a zombie from a grave, the official choices around the world. But there is simply not enough world for both arms and bread. The hungry in our cities stretch out their hands for bread, and we give them a stone. Every fourteen hours, we are told, our Department of War, with the help of Honeywell and others, spends more than the total budget of the United Nation’s food program. Thus Honeywell and others seed the earth with a poison of cupidity and violence. We are the largest purveyors of international turmoil through the part we play in the arms trade. Since 1960—figures are beyond imagining—we have sold over $90 billion of arms abroad. The sales, of course, are carefully huckstered, dollar for dollar. The poor nations receive obsolete Vietnam-era weapons. The oil-rich nations are sold the most sophisticated and advanced ones. In each case, however, to the same effect. The poor of the world grow poorer, as year by year the international arms sales of our country far exceed total foreign aid to all poor nations. I think of the workers at Honeywell; we have met workers in so many of these death factories. Many of them have been persuaded, with a kind of bottom-line, domestic selfishness, that at least this death-huckstering is of benefit to ourselves. Alas, the facts support nothing of this. Military spending, as we are beginning at last to understand, results in a highly inflated domestic economy and the loss of thousands of jobs. Seymour Melman has been a careful researcher of these matters of the economy and the arms race. He notes that the permanent war economy produces nothing of benefit to the lives of people. Simply put, the bombs, conventional and nuclear—and of course, the difference between the two is constantly being blurred by technique—represent only a Catch-22. Either they are used, here or elsewhere, or they are buried or hidden in the earth, a deterrent, we are told. But in any case, the weapons are unassimilable, nondegradable, a death hazard to the future. Can they be marketed or converted for any peaceable use? They have nothing to offer the living. Melman insists that the arms race inevitably aggravates unemployment. The number of jobs created by the military is far less than the number created through development of civilian goods and services. He points to an ominous pattern: Every time the war budget is increased by $1 billion, eleven thousand jobs disappear. It’s hard to choose among tragedies. But whole generations of talent—skilled, well-educated people—have been distracted by the arms race from useful prohuman production and work. In New York, highly seeded engineers and scientists step around us or over us during our protests at the Riverside Research Institute. We note the shame on their faces, the anger masking their loss of pride in their work. As many as one-half of all American scientists and engineers are now caught in a monstrous, sticky web of death. It requires no great insight to judge the results of this enormous imbalance and waste. We have lost a whole generation of necessary skills, stolen from the civilian sector. As a result we are helpless to create, cheaply and well, the simplest goods: transport, housing, electronics, even clothing and shoes. You may have read of the debacle when Boston and San Francisco required new subway systems. Only one American corporation, converted from helicopter production, was prepared to manufacture the new cars. All the electrical circuits were imported from western Europe. And years later, after cost increases and delays, the systems are still malfunctioning. When the New York City subway system desperately needed new cars, we brought a corps of Japanese engineers to live in the city, ride the subways for months, take notes, go back, and produce the cars. Until recently, in the years since the Second World War, the Japanese have stressed a peacetime economy. The results are striking. America has imported over half our automobiles and most electronic equipment, TV sets, and radios from Japan. We have exported only such materials as wheat, oil, coal, and logs. To state the matter differently, as Melman does, America stands in relation to Japan as an underdeveloped colony to a developed country. We send the raw materials, Japan exports finished products of advanced technique, cheap and well-made, edging us off our own market. I recently lectured on these matters at a campus of the University of Kentucky. A professor introduced himself after some discussion along these lines. He had just returned from Korea. He noted, with a kind of astonishment, that virtually all imports from the United States have stopped. With one exception; Koreans cannot manufacture—as well, with such sophistication, and as cheaply as we can—weaponry. No one needs instruction in the sorry matters of cost overruns, padding, bribery, boondoggling, expensive mistakes, all plaguing arms production. Nor do we need to be told, whether in New York or the Twin Cities of Minneapolis and St. Paul, how our cities go to rot, how human needs are ignored or neglected. On the streets of New York City in the past bitter winter, by modest estimate, dwelt fifty thousand homeless people; many of them died. A word should be said about the part played by churches and synagogues in all this. Until recently the officials of these establishments have been treading very warily, taking the long road past their own responsibilities. Catholics know with shame that we have the least equivocal teaching on the arms race of any Christian body except, very recently, the Methodists. Still, we must confess that Catholics are among the most enthusiastic supporters of the race to oblivion. Christians and Jews believe in the mitigation of terror, so we are told; we believe in peace. But lurking in the back of the mind is that other. That unexorcised enemy, whose conduct in the world forbids give and take, forbids compromise, forbids mutual trust and listening. We reach now and again for the Gospel or the Torah, but with half a heart and with a paralyzed hand. And often as not, with a weapon in the other hand. Thus the striking anomaly in the religious community; churches clearly, repeatedly, have condemned the arms race, yet enormous numbers of believers engage in the arms race. Either they are never instructed, or they choose to ignore the teaching. The renowned head of the Riverside Research Institute in New York is a fervent Catholic. He has refused for fifteen years to speak with us about his belief and ours. We have invited him to a neutral place to discuss such matters; he responds to the effect that he would not sit down with such as us, but he would attend Mass for us. This is known as cold comfort. We think of the millions of Americans in our midst who pay taxes for war, even while they attend churches and synagogues. The taxation of church members is an enormous, irreplaceable resource to the military budget. Such taxes must be accounted an important underwriting of a permanent economy of terror. Their sum is larger than the churches’ total spending on all programs of justice, peace, or charity. And through withholding arrangements, nearly all the religious bodies act supinely as collecting agencies for the warmaking state. In such ways, even in so-called peacetime, the religious establishment is permanently inducted into the military. All sorts of noble sentiments are on record, both here and in Europe; but we must also scrutinize our conduct. Many reasons suggest themselves for what Robert Jay Lifton would call our permanent “psychic numbing.” The Cold War, thirty years of it, spans the lifetime of most of us. It has laid a chill on existence, on compassion, on our sense of living with and even rejoicing in human variety; a very chill of death. A plague of technique in the service of killing has all but overmastered us. Such technique, for all its talk of security and peace and balance of power, is only a sure and faster means of self-degradation and destruction. The tragedy is occurring. The catastrophe is underway—in our conscience, in our willingness to live with three hydrogen bombs produced each day, to live with a scope of weaponry which blurs any distinction between conventional and nuclear destruction. When post-Vietnam conventional weaponry was unleashed in the assault upon Beirut, by common estimate its total force was that of a tactical nuclear weapon. Which is to say, everyone perished, everyone within striking range. And this horror was wrought, in very large part, with Honeywell Corporation weaponry. The fate of the earth, the fate of children, rests in the hands of serious people, who wish to vindicate our humanity to ourselves—the nonabsurdity of our own faces—what we might call the correspondence between modest claims and modest conscientious activity. This makes the resistance at Honeywell a crucial challenge to the horrid arms race. We know in our bones, we will not indefinitely have in the same world such weapons as Honeywell is spewing forth, and such children as might inherit a decent world. We choose; no one can choose for us. Honeywell has already chosen. It destroyed the children of Vietnam. It destroyed the children of Lebanon. It is presently declaring open season on the children of Nicaragua and EI Salvador. It would be foolish to conclude that this same contempt would spare the children of America. Let us choose then for life, for the children, and for the future. The Honeywell Corporation, that benign signature on home thermostats, makes weapons and weapons-control systems. In the 1960s, a time when many Americans were noticing our undeclared war in Southeast Asia, a small group of people became aware of the role of corporations in weapons production. Our leaders were pouring our national resources into fighting the war in Vietnam, and it was being fought with hideous weapons like napalm, supplied by Dow Chemical, makers of Saran Wrap, and cluster bombs, supplied by Honeywell. Citizens of our nation, like people everywhere, overwhelmingly prefer peace to war, and in our horror at the presence of a major weapons contractor in our community, we looked for ways to persuade Honeywell to stop making these bombs. Calling ourselves the Honeywell Project, we leafleted workers, wrote stories for the press, and tried to exert pressure on the corporate directors. We puzzled over the presence of the chief executive officers of a dozen major local companies on Honeywell’s board of directors. How could these pillars of our community be involved in the dreadful business of cluster bombs, missile guidance systems, and the grisly research program called the automated battlefield? Working together, researching, marching, discoursing in the Project, we learned that many of these local companies, including Northwest Airlines and Northern States Power, also held war-related government contracts. Reluctantly, we began to understand that the logic of capitalist enterprise favors production for war because weapons of destruction are used up, in their destructive employment, and if they are not used they quickly become obsolete, creating an inexhaustible demand for more. Reluctantly, we also learned that our beautiful ideals of freedom and democratic process could be subverted by corporate interests. Government war contracts—we soon learned that the word defense is a euphemism—go to companies that lobby for them, and our local businessmen maintain an active war lobby. We did what we could. A few members bought single shares of Honeywell common stock, so we could go to the corporate annual meetings and introduce shareholder resolutions asking the company to stop manufacturing weapons and engaging in weapons research. We called on management to involve their workers in corporate decision-making; we demonstrated in the streets. On one notable occasion, police in riot gear beat and gassed some of us while others of us sat at an annual meeting and did our best to educate other shareholders about where the nice corporate profits were coming from. Over the years one man, Marv Davidov, has been the moving spirit of the Honeywell Project, which has reflected most contemporary social movements, from hippies to yuppies. Our supporters now include feminists, Greens, Catholic Workers, New Jewish Agenda members, anarchists, Friends, and many who resist any such definitions. Honeywell Corporation is still deeply involved in weapons manufacture and research, including a large Strategic Defense Initiative (SDI or “Star Wars”) contract and millions of dollars worth of conventional and nuclear weapons. And we’re still working to change corporate policy in any way we can. Before it’s too late; before we slide altogether into … the Hole. The Honeywell Project was transformed into Alliant Action when Honeywell sold some of their weapons shares to Alliant Tech Systems. The Alliant Action Vigil continued in Hopkins, Edina, and Eden Prairie, Minnesota (suburbs of Minneapolis/St. Paul) for many years until Alliant Tech Systems moved their headquarters east to Maryland to be near Washington DC to entertain and lobby potential funders. Action against the Honeywell Corporation has transformed into action around killer drones, which they manufacture parts for, led by the kNOowdrones.com coalition. The Honeywell complex between 26th and 28th Street at Fourth Avenue (2701 Wells Fargo Way) in Minneapolis is now occupied by Wells Fargo Mortgage. 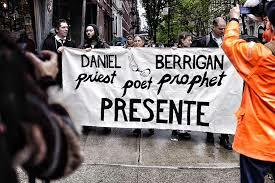 DANIEL BERRIGAN participated in many symbolic acts to expose a culture of violence, including the burning of draft records at Catonsville, Maryland, during the Vietnam War. In response to the threat of nuclear destruction, he acted nonviolently for peace in such places as the Riverside Research Institute in New York City and the Pentagon. In 1981, he, his brother Philip, and six others performed the first “Swords into Plowshares” action. Out of this act of resistance the film In the King of Prussia was directed and produced by Emile deAntonio. 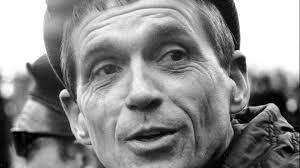 As the author of poems, plays, parables, and journals, Berrigan has been honored by the Lamont Prize and many other literary awards. A Jesuit priest, he lived and worked in New York City. Wonderful men and woman too but these men did beyond what most folks would do. They inspired many to do similar actions. And once again we are on the brink and mary are considering civil disobedience.